In order to make Facebook as open and connected as possible for everyone, one of our goals is to understand how different populations of users join and use the service. With that objective in mind, the Facebook Data team recently sought to answer the question, “How diverse are the ethnic backgrounds of the people using Facebook?” This is a tough question to answer because, unlike information such as gender or age, Facebook does not ask users to share their ethnicity or race on their profiles. In order to answer it, we focused on a single country with a large and diverse population—the United States. Comparing people’s surnames on Facebook with data collected by the U.S. Census Bureau, we are able to estimate the racial breakdown of Facebook users over the history of the site. We discovered that Facebook has always been diverse and that the diversity has increased significantly over the past year to the point where U.S. Facebook users nearly mirror the diversity of the overall population of the country. The graph above shows the proportion of the three largest minorities on Facebook over time as predicted by our model, while the dashed lines show the proportion of the Internet population for the same ethnicities. In this report, we’ll discuss how we are able to measure diversity without user-supplied race or ethnicity. We’ll also explain how race and ethnicity have varied over the course of Facebook’s history and explore future research for understanding friendship diversity on the site. The U.S. Census Bureau’s Genealogy Project publishes a data set containing the frequency of popular surnames along with a breakdown by race and ethnicity. These data are the key to our analysis, so we will spend some time describing them in some detail. An example of the raw data is shown below for the three most-frequent surnames in the census: Smith, Johnson and Williams. These data provide the rank in the population, the total count of people with the name, their proportion per 100,000 Americans, and the percent for various races: White, Black, Asian/Pacific Islander, American-Indian/Alaskan Native, two or more races and Hispanic respectively ((While there are many preferences for describing people’s race and ethnicity, we have chosen to use the terms used in the U.S. Census to be consistent with our data.)). This data set allows us to predict what a person’s race is based solely on his or her surname. While these predictions will be often be wrong, in aggregate they will be correct. For example, suppose you select 10,000 people with the name Smith from the U.S. population at random. The data above suggest that 7,335 of them will be White, 2,222 will be Black and so on. Certain names will be more predictive of a certain race, while others will predict a wide array of ethnic backgrounds. The table below shows the top three names within the top 1,000 ordered by the percent in a given group. It shows that some ethnicities have distinctive surnames while others do not. For instance, 98.1% of individuals with the name Yoder are White while the most predictive name for American Indian / Alaskan Native individuals only has 4.4% in that group. For this reason, we will only look at White, Black, Asian/Pacific Islander and Hispanic predictions in our analysis. A simple technique for finding the distribution of ethnicities on Facebook is as follows: given the users who are on the site at a given time, sum the total users with each name in the Census Genealogy data. For each of these names, we estimate the total number of each ethnicity by multiplying by the numbers above. As in the previous example, if we have 10,000 Smiths on the site at one time, then we assume we have 7,335 White users, 2,222 Black users, and so on. One potential source of error in this estimate comes from our assumption that users are selected at random from the U.S. population. What if Facebook is primarily White? Wouldn’t a majority of the Smiths be White then, breaking our assumption? In order to address this, we refine our estimates using a statistical technique known as mixture-modeling. We imagine that people come from a population with unknown racial/ethnic proportions. Individuals then get assigned names based on their race/ethnicity. Under this assumption, determining the ethnic makeup of Facebook becomes a problem of back-solving each individual’s ethnicity using only their revealed name. By allowing the Facebook population to be different from the Census population, and for each name to inform our interpretation of every other name, this technique allows us to more accurately estimate the expected number of Facebook users of a given race or ethnicity at any given time. Finally, we adjust the estimates in our analyses with Internet adoption rates based on values from the National Telecommunications and Information Administration report on the Networked Nation. We use the percent of households with Internet access as a proxy for the addressable Internet population of each race or ethnicity. Given the approach outlined in the methodology section, we obtain a picture of how the relative makeup of Facebook’s racial subpopulations within the United States. Because the Facebook population is changing over time, as is the ethnic diversity of addressable Internet users, we compare these groups over time. At each time step we recalibrate our model to account for the set of people on Facebook. 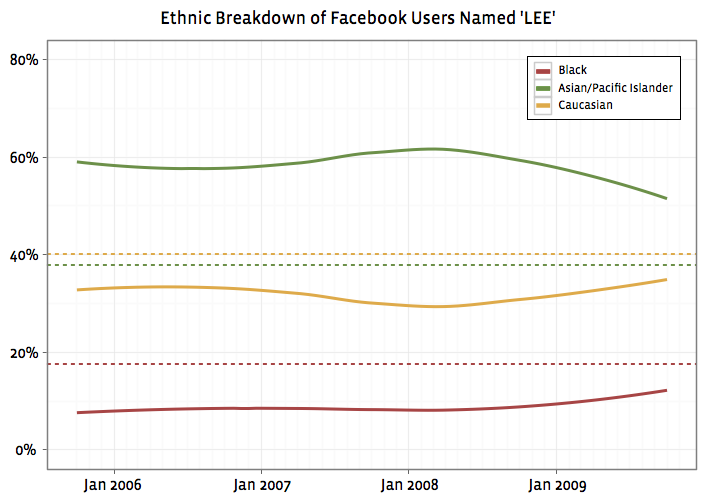 To illustrate this, the following plot shows how the model’s estimate of the distribution of the surname Lee has changed over time, tracking the change in Facebook’s population along with the change in our predictions of ethnicity. The dashed lines show the ethnic breakdown of people named Lee given by the Census Bureau tables described above. The disparity between the solid and dashed lines shows the possible bias when estimating race/ethnicity without the adjustment we describe in the previous section. For instance, the Census numbers would underestimate the number of Asian/Pacific Islanders on Facebook and overestimate the number of Black users on Facebook. Looking at all users who have joined over the history of Facebook, we can examine the total population of that race on Facebook as predicted by our model at every point in time. These predictions are shown in the following chart. The chart conveys little about the diversity of Facebook since the growth of the site has affected all populations, and the U.S. population is predominantly White. 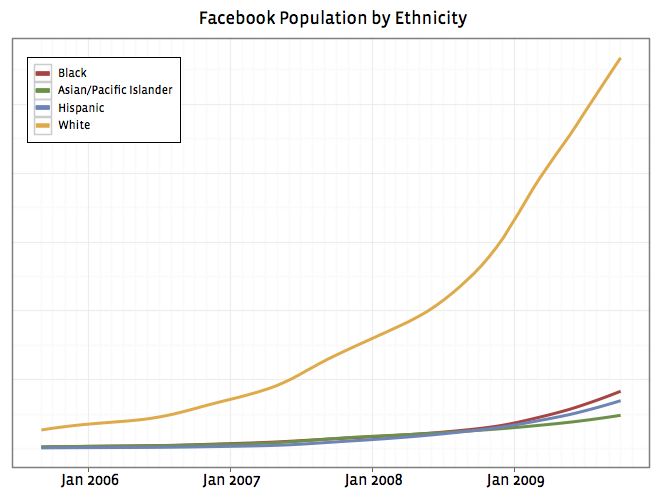 To look at the diversity of non-White users, the example shown at the top of this post shows our model prediction as a fraction of the Facebook population as well as the percent of the overall U.S. Internet population for each ethnicity. Here the solid lines show the Facebook percentage while the dashed lines show the U.S. population (in this case, we have chosen the U.S. population at the end of the time period). Because White users are a large majority, we have left them out of this plot. Another approach to visualizing this data is to look at the relative saturation of each race. This is the fraction of users on Facebook compared to the fraction we would expect from the U.S. Internet population at that time. For instance, if Facebook had 100M users, and Asian Americans made up 4.4% of the U.S. Internet population, we would expect to find 4.4M Asian users on Facebook. If instead we observe 5M then the relative saturation would be roughly 114%. 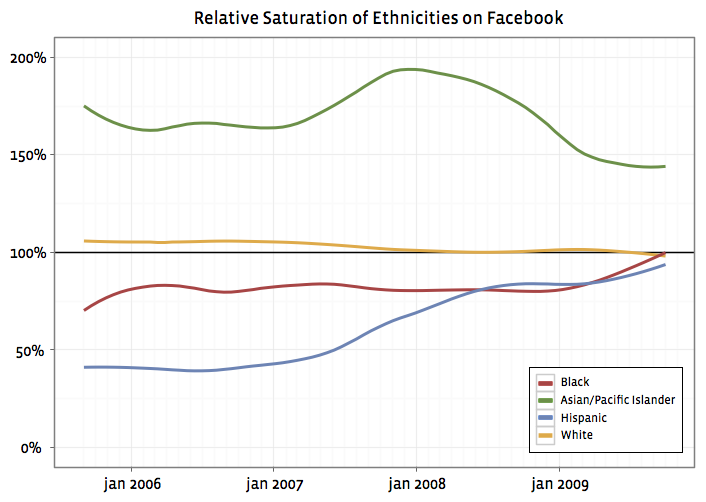 The plot above shows Facebook saturation by ethnic and racial groups. 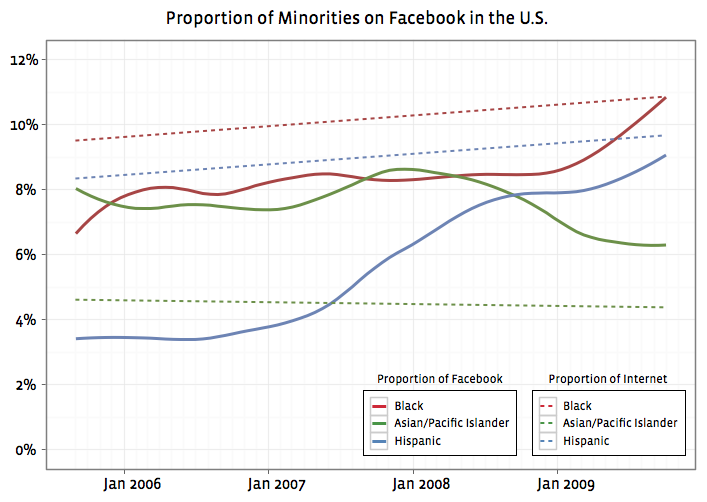 Since 2005, Asian/Pacific Islanders have been much more likely to be on Facebook than Whites, and that has remained so. While Hispanics were once 40 percent as likely as Whites to be on the site, this number has been steadily climbing since early 2007 and currently is at 80 percent. This graph also shows that Black users are now about as likely to be on the site as White users. In this post we have outlined an approach to determine the racial and ethnic breakdown of a population based solely on people’s surnames and data provided by the U.S. Census Bureau. We have found that while Facebook has always been diverse, this diversity has increased over time leading to a population that today looks very similar to the U.S. population. Since completing this initial work, we have started using the first names of users to increase the precision of our predictions. While in this post we have only looked at the diversity of the population as a whole, we hope to use predictions of race and ethnicity for individuals, along with their friend connections, to understand how these populations of users are connected to each other. We are working to understand how diversity of interpersonal relationships is changing over time as more users join the site and find their friends. The work in this post was a collaborative effort between the data scientists Lars Backstrom, Jonathan Chang, Cameron Marlow and Itamar Rosenn. This is a cross-post of the note on the Data Team Facebook Page. It’s one of the classic maxims of the baby name business: most parents who like “androgynous” names really like masculine-sounding names for both sexes. Parents of boys carefully avoid anything feminine. When a boy’s name starts to show up on the girl’s chart, the male version’s days are usually numbered. …Does that mean an entire generation of names is destined to turn feminine? Will boys eventually find themselves stranded on a tiny name island with nothing but kingly classics and absurdly macho inventions to choose from? Don’t panic yet, parents of boys. There are reasons to think that this crop may be different. Let’s just say I’m happy to be an ur-cameron. Besides being an advertisement for Facebook and Google internships, it does raise the question of how schools can adopt these technologies quickly enough to teach them. There have been lots of industrial partnerships and government grants for research clusters, but these are far from a standard undergraduate class on the topic. I would love to see Cloudera or a similar company partner with a hardware provider to make clusters affordable and easy to configure, while data scientists can make sure that they come pre-installed with some interesting data (Wikipedia, Twitter, etc.). With a consistent installation across institutions, professors can write and teach data science without the immense operational overhead of setting up a cluster and getting it operational.